US clearly dominates the world when it comes to military expenditure, both in % of GDP and nominal value. the voters in these countries [Germany, France, UK etc.] vote for social services like health care instead of military spending. This debate was also present in my homeland where some argued that money should go more to education and health rather than the army. There seems to be a discrepancy between Western democracies (US vs. Western Europe) when it comes to military expenditures. Question: How does US manage to maintain such a high military expenditure? There are many facets to this issue, I'll try and touch on all of them. This is probably the most well-known aspect of the military-economic aspects of the United States. Being a huge producer of arms during the world wars and suffering no foreign invasion that would impede its production or force it to reconstruct post-war made for a large post-war arms industry that continued to grow as the cold war set in. As you can see in the graph below, leading up to and following the collapse of the Soviet Union defense spending did indeed begin to drop, however the 9/11 terrorist attacks and the following wars in Iraq and Afghanistan reversed the trend. As Blip pointed out, the US has the some of the lowest voter participation of any developed democracy with voter turnout in the 2016 presidential election being 55%. The 2014 midterm elections saw only 36% voter turnout. There is a combination of factors at play here I believe to be outside the scope of this question, but the important takeaway here is that the US path to public office rewards extremism due to the primary election process. Those on the far-right side of the aisle have historically been extremely in favor of supporting the military, and thus candidates that express ardent support of the military are the ones that survive the republican primaries. Moderate republicans who may want their tax dollars spent elsewhere are left little recourse. The United States has a long history of maintaining a strong military, and economic infrastructure has been built up around this large military such that there are diverse parties with vested interest in keeping the level of military of spending high. This is exacerbated by the political campaigning process in the United States which favors extremism, and low voter turnout such that the most passionate and motivated voters - generally the most extreme - are the most represented. However, as you can see in the graph above when there is not a war at hand spending drops, and one could presume that in the absence of the 9/11 attacks the decrease in spending that began in the 90s would have continued. As it is the US is coming off of the Iraq and Afghanistan wars, as well as operations against ISIS, and the trend of lowering military spending as a % of GDP has resumed. The story of why the U.S. came to have such a large military is path dependent and wasn't always the case. The U.S. had little defense spending relative to GDP prior to, and after, the U.S. civil war, except for a brief surge during WWI, from which the U.S. promptly and dramatically demobilized. 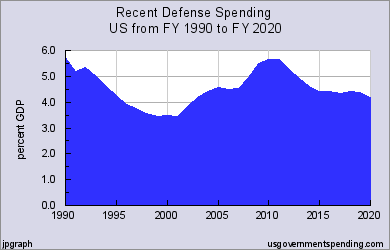 But, after a huge WWII surge in defense spending, that spending stayed high due to the post-WWII Cold War. In the Cold War, the U.S. felt that it was in a bipolar military-political environment. Europe was in ruins and needed U.S. economic support from the Marshall Plan to rebuild. Russia needed to be opposed militarily, and the U.S. as the sole economically stable representative of non-Communists, stepped up to the plate. The Cold War required a military build up, on threat of nuclear war which was still believed to be winnable, and was punctuated with full fledged wars/military actions such as the Korean War and Vietnam War. After the Vietnam War, Ronald Reagan adopted a policy of high levels of military spending to force the USSR to match this spending on the premise that the U.S. had an economy more capable of engaging in this defense spending without collapsing than the Soviets, a concept many considered historically vindicated when the Soviet Union collapsed in 1989, following in close succession by the splintering of Yugoslavia and Czechoslovakia, and the unification of Germany. In the wake of the end of the Cold War, U.S. military spending declined significantly, until 9-11 in 2001, when spending was devoted to fighting wars in Afghanistan, in Iraq, and a "war on terrorism" with a global scope. This peaked around ten years later, and has since declined again, but not as rapidly as it did after the Cold War. After all, the war in Afghanistan and the global "war on terror" re ongoing, and the U.S. involved itself in the war against ISIS in Syria and Iraq, after ending the "Iraq War". Countries in Europe, in contrast, which he leaned on U.S. military protection via NATO in the early days after WWII, and which lacked the resources to participate more directly in the Cold War, normalized a lower level of military expenditure, and refrained from making nearly as great an economic commitment to fight wars in the Afghanistan and Iraq as the U.S. did as a leader of those coalitions. U.S. leadership discouraged collective action by Western Europeans to invest in national defense, when the U.S. had a status quo ante of meeting those needs on their behalf to some extent. The U.S. also had engagements in Bosnia and Kosovo in the post-Cold War period motivated by humanitarian concerns and the ready availability of U.S. military resources in nearby parts of Europe. Also, the U.S. as one of the largest countries in the world, has global military aspirations that few other countries shared. By 1960, most countries in Europe had granted independence to all or most of their former colonies. Spain and England, which had once sought to maintain world class blue sea navies, abandoned those aspirations to be world class military powers. The Falkland's War was England's last hurrah in that respect. It is much cheaper to fund a military primarily oriented at defense than one intended to maintain global military dominance as a "leader of the free world" which the U.S. aspired to be and could afford better than its fractured peers could unilaterally. Domestically, defense spending was something that had bipartisan support during WWII and in the early days of the Cold War, and continued to be a signature issue of one of the two major political parties, the Republicans, whose members were much more likely to have been military veterans than Democrats, and who held a more antagonistic view of Communism which was nominally a politically left leaning ideology. In the 1980s there was a de facto three party system in the U.S., with Southern Democrats siding with Republicans on defense and social issues, while siding with Northern Democrats on economic issues, before realignment ran its course. Since then, Democrats and Republicans have been relatively evenly balanced in political power and alternated control, with Southern Democrats as late as Bill Clinton being wary of losing moderate support by not being sufficiently "pro-defense." It also bears mention that war seemed more attractive as an option to the U.S., especially when those wars were foreign, than for many of its developed world peers. Europe was ruined by WWI with a high cost in blood and treasure from that war, only to experience phenomenal costs in blood and treasure again in WWII. Those wars were fought on its ground. Japan, similarly, paid a dear price for the part of the war fought in its turf. Essentially none of WWI (or Korea or Vietnam) was fought on U.S. territory, and in WWII, Pearl Harbor in Hawaii was the only notable engagement fought in its territory. The U.S. also joined both WWI and WWII years after those wars started for the initial combatants, so those wars for shorter for the U.S. So, the U.S. did not associated the wars for which it was preparing economically with a threat to its civilians, its infrastructure and its economy. Indeed, the wars that the U.S. fought were generally good for its economy, both putting people to work for defense industries, and provisioning the world which was economic setbacks due to war related damage afterwards. If you look at the history of United States defense spending, the percentage of GDP (3.3%) is actually at a relative low point now. It hasn't been this low since around 2002. It was never this low during the entire Cold War period. According to Wikipedia, the US is the eleventh highest spender by GDP. Again, if we look back to just 2011, the US would have been higher on that list. That year, the US had half the defense budget of the entire world. I.e. the US spent more on defense than every other country combined. The US has since fallen back to about a third of the world's defense spending. The US spends 50% more than the world average of 2.2% of GDP. Most US defense spending is spent domestically. Of the 1.3 million active duty troops, less than 200 thousand are overseas (source: Pew Research). Research and Development and maintenance of nuclear weapons are spent entirely domestically. In the last ten years, the US has borrowed more money than it has spent on defense. Even if the US zeroed the amount spent on defense, this wouldn't free up any money for other expenditures. It's also worth noting that all levels of the US government combined actually spend quite a lot on healthcare, more than the United Kingdom as a percentage of GDP. The US spends more on education than defense, although most of that spending is private rather than government spending. Note that that was true even in 1990 when education expenditures were lower and defense spending was higher. It seems unlikely to have changed since. Education has gotten more expensive while military spending has declined. U.S. education spending tops global list, study shows is an example of a source talking about the combination of public and private money, although it doesn't give a total nor define "student". The dominant American Foreign policy is some variation of "The Monroe Doctrine" which is best summed up as "If you want to start trouble, you are not starting it here." And the military has largely been set up to enforce this. In the early days, this was quite easy as America really only had to maintain a small military force to counter European and Native American threats on the mainland, both were not to powerful... and if war broke out, reinforcements were difficult to get to the Americas before the US could increase its own forces. The U.S. Civil war still remains the bloodiest war fought in the hemisphere with Gettysburg being the biggest battle in the hemisphere to date. Up until the end of WWII, the United States had only ever participated in a war as a defender nation (or presumed defender when they made the declaration, such as the Spanish-American War). The reigning political thought was "It's not our problem unless they make it our problem." This changed with the cold war as Communism was deemed antithetical to the American ideals and had a mission statement of global communism. The US invested heavily in preventing the spread, which was the goal of political Communist thinking. Again, this isn't so much opposed to Monroe Doctrine as the goal was preventing Communism from reaching the Americas. It's telling that the closest the U.S. ever got to declaring Nuclear War was when Russia started deploying Nukes to Cuba and the nation collectively lost its mind. The US was able to ultimately win in while they had an irrational fear of the Communism, The Soviet Union had a very rational fear of the United States. After all, they are the only nation to use a nuclear weapon in war. And we didn't really hate the Japanese people's way of life when we were in that war. But we hated Communism. So the U.S. kept up military spending to scare off a Soviet Attack... and the Soviet Union tried to keep up with us. (The Soviets never had the edge in the "Bomber Gap" and only briefly had it in the "Missile Gap" but they were much better at hiding this and had the U.S. convinced they had better missiles and more bombers than the U.S. did). It became a game of chicken that eventually forced the Soviet Union into defeat as they couldn't keep up with U.S. spending, having been hit by several food shortages, the Afghanistan War, and Chernobyl. This strategy has actually been able to protect the most important asset in the US military arsenal: The Troops, very well. In it's entire history which doesn't have a lack of war in it, The United States has lost about 2.7 million to casualties of War (Both wounded and unable to fight and killed) in its entire history. Compare with the Soviet Union, which had lost about 2.9 million people to non-death related causalities in WWII alone. By these numbers the United States is expected to lose an annual average 11,500 people to Death of War, which sounds like a lot, except that the average rate of deaths from civilian automobile accidents is around 40,000 per year in the US. The U.S. Public wants to the military to do two things: Keep the enemies "over there" where they belong and to send home as few of their troops in boxes as possible. To do this, they are willing to put more money into the military than similarly developed nations. As mentioned in comments, this has also meant that a large portion of the US economy is driven by the military. In fact, it's not uncommon for entire communities to become Ghost Towns when the local military base is closed down for budget reasons.